Amber Rose & Wiz Khalifa are so much in love that it's almost sickening...lol. 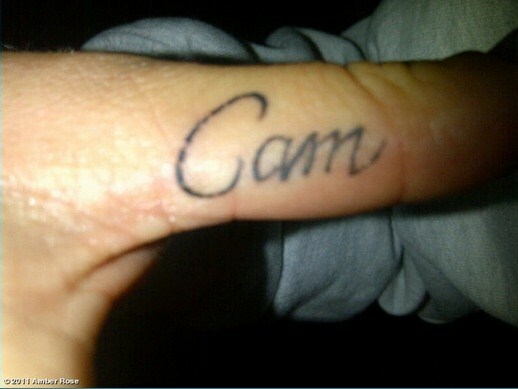 Check out Amber's new tattoo that she recently twitpic'd in the name of love, literally she tats Cam aka Cameron Jibril Thomaz (Wiz Khalifa) on her finger. 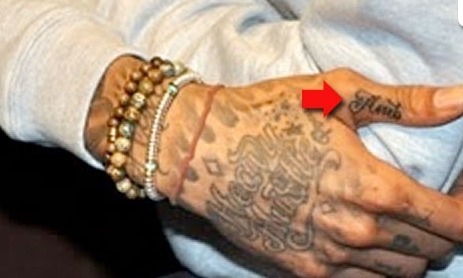 Wiz Kalifa did the same recently of his boo "Amb". I have a relative that did the same thing on his ring finger of what is now his ex-girlfriend. Luckily he was able to change the tattoo, because his current girlfriend wasn't having that. Would you tattoo your mate's name on your body? Check out Amber and Wiz's tattoo's and tell me what you think.